Every parent wants to have a well-stocked arts and crafts cabinet. The goal is an understandable and even noble one. 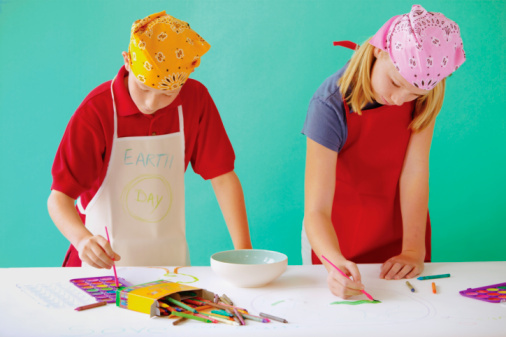 Who doesn’t want to be able to help their kids do whatever craft project they dream up? If you aren’t careful, though, you’ll go overboard in the craft supply stores, and even though your cabinet gets packed, it won’t be packed with supplies that are actually useful. So much fun stuff! But what’s the most important? Here are the top ten crafting supplies you always want to have on hand – everything else is supplementary and can be purchased as needed. You can start with a couple of those giant packs of paper that seem to have a few sheets of every color in them. The trick to making sure your construction paper lasts is to save the scraps. As your kids cut out shapes and use portions of the original sheets, saved what’s leftover in different folders or envelopes, separated by color. This way you won’t be using up an entire orange sheet of paper when your daughter just needs a small triangle to make the beak of the bird she’s building. Crayons are fantastic and can be used over and over again for all sorts of different projects. Get a couple of the boxes with the most colors and then dump all the crayons into a single big tin. This way they’re easier to get at, and there won’t be as much pressure to put them back in exactly the same spot in which they started. Every kid loves to paint, but not every parent loves the mess that painting creates. Watercolors are great because they’re inexpensive (so you won’t mind if they get used up) and they’re easy to clean up when the paint bleeds off the paper or drips on the floor. Make sure you keep extra brushes on hand as well! You don’t have to keep the expensive stuff that crocheters and knitters like to use (unless you have kids who are super into and good at fiber arts). Grab a few colors of the cheap stuff the next time you’re at the craft store. Yarn is great and can be used for all sorts of different craft projects. While little kids probably won’t take much notice of the embroidery floss in the cabinet, your older kids will love making lanyards and friendship bracelets with it. Luckily, it’s cheap, so you can get it in mass quantities and in lots of different colors! What do they want to make today? Pipe cleaners are fantastic – they can be used for building, decorating, and a bunch of other stuff. Get a huge bag of them – the kind that has the pipe cleaners in lots of different colors. You’ll be amazed at what kids will do when given a few pipe cleaners and are told to get creative. A couple bottles of the same white glue they use in school is really all you need to have on hand, but if you’re mess-averse, you can also get a lot of mileage out of a few glue sticks. Kids’ scissors are important. Keep enough pairs on hand to supply all of your kids with a pair of their own – and then add a few extra. These scissors get lost really fast, and you want to be prepared for play dates and group projects. Sometimes these are called Popsicle sticks (in fact, you can supplement your supply with washed-off actual Popsicle sticks after your kids finish eating their treats), and they are an important part of every craft supply. They can be used to build and to support and for a bunch of other things! You don’t need fancy beads. Some basic plastic beads will do. You can buy these by the hundreds at craft stores. 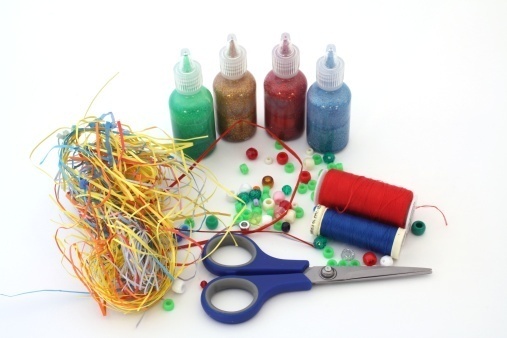 Kids can use the beads to make their own jewelry or to add dimension to other craft projects. Honorable mention: glitter. You already know how much fun glitter is for kids. It only gets an honorable mention, though, because it is insanely messy, and most parents really hate it. From here you can supplement with markers, colored pencils, card stock, printer paper, googly eyes, pom-pom balls, and whatever else looks interesting. Have fun with it! Erin Steiner has written extensively for and about a variety of individuals and businesses and covers a variety of topics such as parenting, “What is bad credit?”, finance, and more for publications all over the web. Safety Scissors among the best you could mention in my opinion. Thanks for sharing. Have an awesome week ahead! These are the craft tools that I usually buy when I do my DIY projects. « Montessori Education: What’s the Big Deal?